This week the Chinese Communists celebrate their sixtieth year in power, an event that the make-war-not-peace crowd might benefit from contemplating. 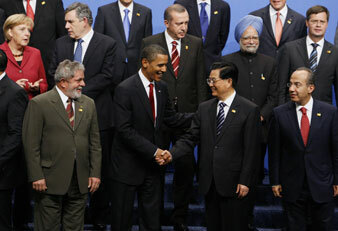 President Obama shakes hands with Chinese President Hu Jintao at the G-20 summit in Pittsburgh, Sept. 25, 2009. This week the Chinese Communists celebrate their sixtieth year in power, an event that the make-war-not-peace crowd, now bloviating over Iran and Afghanistan, might benefit from contemplating. They might also recall a time when the mere suggestion of peaceful coexistence with the Red Menace of China was a career-ender for high school teachers and State Department officials alike. Now the danger from the Chinese Reds is that, being more prudent capitalists than Americans, they might be unwilling to continue carrying our rapidly growing debt. According to the demonology that has long driven US foreign policy, no country has ever cast a larger shadow as evil incarnate than Communist China. All communists in the Cold War era, like all Islamic radicals today, were assumed to be part of a unified internationalist movement bent on world conquest. And the Chinese, as the Iranians now, were thought to be the worst of the pack. Incapable of change and therefore the fit object of unrelenting hostility, they needed to be confronted militarily, up to the point of nuclear annihilation if that’s what it took, as the taped musings of various US presidents attest. This was also a prospect for Iran that Hillary Clinton contemplated as a presidential candidate. Communism once was, as the Islamic terrorist threat is today, presented as an undifferentiated revolutionary impulse that could never be diplomatically accommodated without sacrificing our own security or, indeed, our freedom. The various communist nations and movements, like those currently led by a polyglot collection of Islamist radicals, were stripped of any complexity, be it in their national identity or ideology. That mentality prevailed until the day that President Richard Nixon suddenly decided that we could do business with Mao Zedong, the most fervently revolutionary communist of them all. What Nixon recognized was that the Chinese Communists were, like their Soviet counterparts, nationalists first and foremost. Any notion of an international communist conspiracy with a timetable for the takeover of the world (the correct answer on more than one social studies test I took as a kid) was rendered absurd by the fervent, even xenophobic, nationalism of a Tito, Castro or Ho Chi Minh. All of them made their revolutions, as did the Chinese, without significant outside help and were hostile to any foreign interference, no matter the source. Ho, who had successfully battled French colonialists, hardly wanted to exchange them for the Chinese overlords who had governed his country for a thousand years. Yet that obvious fact did not stop Nixon from continuing to kill millions more in Vietnam and Cambodia in the name of combating international communism–even after he went to Beijing to toast Mao. Fast-forward to last weekend, when John McCain, as his way of justifying an escalation in Afghanistan, was on talk shows bemoaning our failure to win the Vietnam War. Nobody asked him what national security purpose a US victory in Afghanistan would serve. Our defeat in Vietnam led not to dominos falling all the way to San Diego, as was predicted, but rather to Communist Vietnam and Communist China going to war against each other. Today those still-communist powers are battling for shelf space in Wal-Mart and Costco. This would have happened without sacrificing almost 59,000 American soldiers and the 3.4 million locals who died in a war that Defense Secretary Robert McNamara said he could never honestly justify. The limits of demonology as a substitute for thoughtful foreign policy are amply on display in the approach to Iran as the purported leading agent of Islamic terrorism. Once again we are the self-defined white hats blithely ignoring our long history of affronting Iranian national integrity. That assault began with the CIA-engineered overthrow of Mohammed Mosaddeq, the last secular elected leader of his country, and continued with our support of Iraq’s Saddam Hussein in his war against Iran. By ultimately overthrowing Saddam, the US vastly increased the power of Iran’s religious hard-liners by installing their disciples in power in Iraq. By supporting the Islamic radicals in Afghanistan, whom Ronald Reagan called “freedom fighters,” the US introduced al-Qaida to that country. Blowback is the inevitable outcome of a dangerous game that must be stopped. What we need is for Barack Obama to pull a Nixon and attempt to cut a deal with Tehran as well as with competing forces in Afghanistan that meets their nationalist aspirations and our security interests. That won’t be easy, since he is a Democrat and the Republican hard-liners will not allow him the slack given to Nixon. It is also true that the Iranian leadership can veer into outrageous behavior, making the international pursuit of peace extremely difficult. But does anyone believe that Mahmoud Ahmadinejad can hold a candle to Mao when it comes to provocative rhetoric?